Cleanroom Synergy offers Metro’s Super Adjustable Super Erecta Shelving units to meet the requirements for most applications. 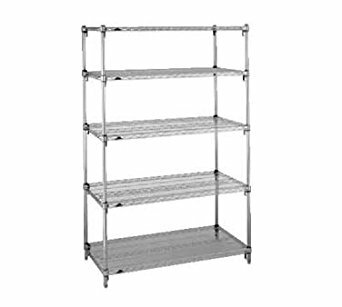 Super Adjustable Stainless Steel Shelving provides excellent corrosion resistance, open wire design that minimizes dust accumulation, and a patented shelf release design for quick and easy no tool shelf adjustment. Shelves can be adjusted at precise 1″ (25mm) increments along the length of the posts. 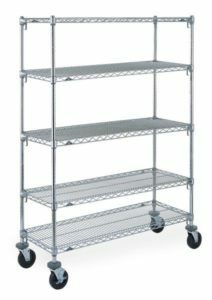 Super Adjustable Super Erecta shelving is available in a variety of finishes: chrome-plated for dry storage; Metroseal 3 with antimicrobial product protection and Type 304 Stainless Steel for corrosive environments. 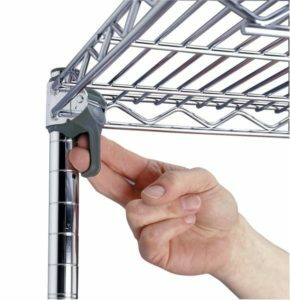 These low profile shelf ledges help to protect items from protruding or even falling from the cart. Ledges can be placed along any side or on all sides if needed. or higher barriers. Ledges can be placed along any side or even all sides or on all sides if needed. These 8-inch (203mm) shelf dividers help keep materials neat and orderly within the storage shelf area.